The soon to be legendary Mrs. Patmore, from the mega hit TV series on PBS, Downton Abbey, is the head cook brimming with one liners that can only be heard from downstairs within the heat of the kitchen and in this case, the heat, directed to her assistant, Daisy, the scullery maid. Mrs. Patmore: Daisy, I said you could go for a drink of water, not a trip up the Nile. Mrs. Patmore: Listen to me Daisy, take those kidneys up to the servery before I knock you down and serve your brains as fritters. Daisy: I was only trying to help. Mrs. Patmore: Oh!…Judus was only trying to help, I suppose, when he brought the Roman Soldiers to the Garden. The duties of the scullery-maid are to assist the cook; to keep the scullery clean, and all the metallic as well as earthenware kitchen utensils. The position of scullery-maid is not, of course, one of high rank, nor is the payment for her services large. But if she be fortunate enough to have over her a good kitchen-maid and clever cook, she may very soon learn to perform various little duties connected with cooking operations, which may be of considerable service in fitting her for a more responsible place. While Mrs. Patmore is taking a well deserved rest, in one scene, Daisy interrupts Mrs. Patmore in the servant’s hall unsure if the crumble was ready. Sorry, you will just need to watch this weeks finale of season 2 Downton Abbey for more of Mrs. Patmore good hearted but sometimes cutting humor. Meanwhile, enjoy My Apple Charlotte Recipe, a dish Mrs. Patmore was not able to plate-up, reason, you'll need to watch-n-see (don't want to spoil the plot). Crumbles can be traced back to the UK, but became highly popular in America during colonization, where it is also known as a crisp. The crumble originated as a wartime dessert due to strict rationing. The crumb topping, or cumble is a mix of flour, butter and sugar and replaced pastry or typical pie crusts. Fruits such as apples, blackberry, and rhubarb are often used depending on seasons or what was previously preserved and on hand. Granny: This Australian native was discovered in 1868 as a chance seedling by "Granny" Anne Smith of Ryde, New South Wales. One parent might have been a French Crab Apple. Grannys are known for their distinctive green flesh, which sometimes bears a red blush, and their very tart flavor. 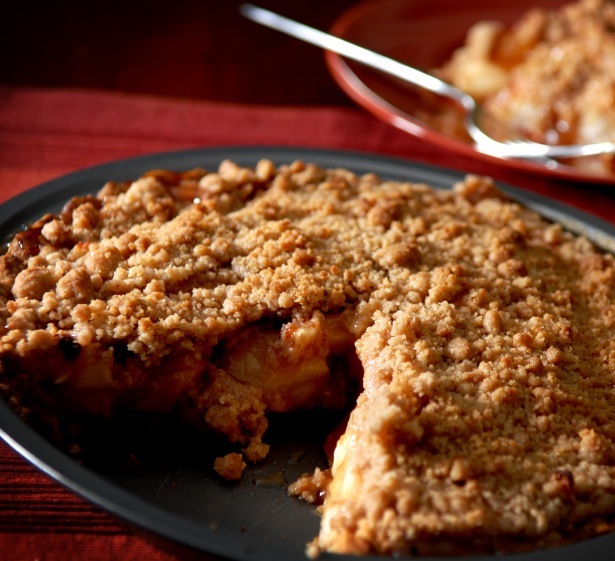 An all-purpose apple, Grannys work equally well as a snack or in pies and sauce. U.S. Grannys are harvested beginning in August, and are available year-round. Gala: This variety originated in New Zealand, a cross between Kidd's Orange Red and Golden Delicious. The Royal Gala strain was named in honor of Queen Elizabeth II, who deemed it her favorite during a visit to New Zealand. It was brought to the United States in the early 1970s, and is now one of the country's most popular apples. This crispy, juicy, very sweet apple is ideal for snacking. Galas can vary in color, from cream to red- and yellow-striped. U.S.-grown Galas are harvested beginning in mid-July, and are typically available year-round. Mix all sugars, flour, oats and nuts. Pour in butter and mix until topping looks like wet sand. Do not over mix; topping should have a lumpy consistency. 4 cups Apples- 1/2 granny and 1/2 gala or other sweet apple, peeled, cored and chopped into 1/2 inch pieces. Pre heat a 375 degree oven. Grease small individual ramekins or one nine inch ovenproof casserole. Add chopped apples, raisins and simple syrup. Top with a generous amount of crumb topping. Bake for 35 to 45 minutes or until crumb topping is crisp and light brown. Serve warm topped with powder sugar, whip cream or powder sugar. Place all ingredients into a saucepan. Bring to a boil and cook for five minutes. Remove and cool.